This kit is designed as a complete replacement for the factory ECU, utilising existing wiring, sensors and mounting hardware to deliver plug-in convenience with fully programmable control. 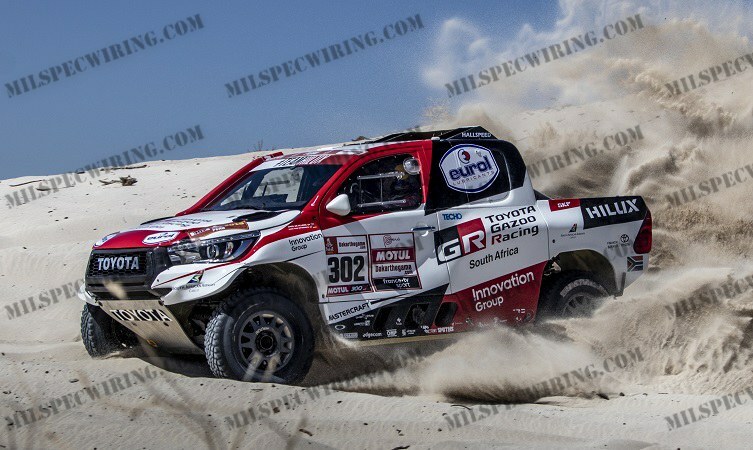 The M1 ECU is supplied with firmware preloaded, providing all the functionality of MoTeC’s GPR Diesel Package with additional features unique to the Toyota Hilux 1KD. The kit includes an adaptor box that operates in conjunction with the factory injector driver box (EDU), eliminating the need for a Direct Injection ECU variant; a MoTeC M130 or M150 port injection ECU controls the injector driver EDU. Two Package variants are available: pre-configured for manual transmission or OE automatic transmission. The M1 firmware provides the required messaging between the engine and transmission ECUs for normal operation. The supplied start file contains all the calibrations and settings for sensors, direct fuel injectors, high pressure fuel pump, throttle control and turbo control. Included are many ancillary features commonly found on race cars, such as launch control, traction control, driver switches (e.g. pit switch, launch enable), gearbox control, intercooler sprays, transmission pump, differential pump and coolant pump. Also accommodated are many systems found on modified road vehicles, such as air conditioning. The product fully integrates with other MoTeC products, and provides pre-defined CAN messaging for all current Display Loggers, Loggers, E888, VCS, GPS, ADR, BR2, PDM, and SLM. A Vector database (.dbc) file is also available upon request. Pre-configured sensor calibrations for Original Equipment (OE) sensors. Pre-configured reference mode for engine synchronization. Pre-configured physical settings for engine displacement, fuel density, stoichiometric ratio, fuel pressure, and injector characterization, which allow for simplified engine start-up prior to tuning. Pre-configured control of high-pressure pump. Smoke Limiting by means of a Fuel Mass Limit table or Minimum Lambda table. Pre-configured coolant temperature compensations for engine speed limit, fuel mass limit, fuel timing, boost limit. Pre-configured boost control of OE VNT servo motor. Pre-configured Swirl Control via 2 switchable inlet manifold flap outputs. Configurable Intercooler temperature and spray control. Configurable launch control with tables for engine speed, boost aim and fuel mass limit. Configurable Traction control with tables for aim main, aim compensation, control range. Configurable closed loop alternator system for OE alternator. Configurable coolant fan output with support for 1 aftermarket coolant fan output (PWM controlled). Configurable coolant pump output with PWM control. Configurable coolant pump after-run functionality, optionally with additional pump output. Configurable vehicle speed measurement using wheel speed sensors. Gearbox shift support with fuel mass limit, throttle blip and engine speed matching in forward gears.